Here's a little debate we had in the TechRadar offices before deciding on the headline to this article; just how much is a cinema ticket these days? Down in London the typical price is currently sitting at around £13, but we've heard legend speak of prices dropping below a tenner in other, more affordable, parts of the UK. Either way, Final Fantasy XV is currently just £9.99 on the PS Store if you're a PS Plus subscriber, which is a fantastic deal regardless of your local cinema prices. Non-PS Plus subscribers can also save a bit of money in the sale. For them the game's price has been reduced by 40% to £29.99. No word yet from Sony about how long this deal is expected to run for, so act quickly if you want to get your hands on some cheap JRPG thrills. Not a PlayStation Plus member at the moment? Or maybe your membership is due a top up? Check out the latest prices below. 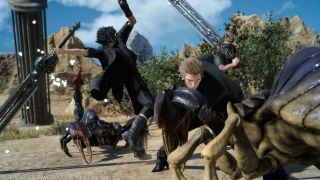 If you want to work out whether the game is worth not just your money, but your time, then check out our Final Fantasy XV review.